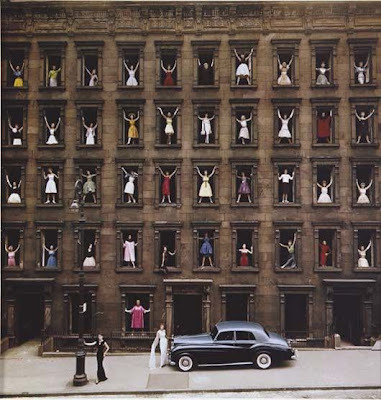 Models in New York by Ormond Gigli, 1960. In 1960, while a construction crew dismantled a row of brownstones right across from my own brownstone studio on East 58th Street, I was inspired to somehow immortalize those buildings. I had the vision of 43 women in formal dress adorning the windows of the skeletal facade. We had to work quickly to secure City permissions, arrange for models, which included celebrities, the demolition supervisor’s wife (third floor, third from left), my own wife (second floor, far right), and also secure the Rolls Royce to be parked on the sidewalk. Careful planning was a necessity as the photography had to be accomplished during the workers’ lunch time! 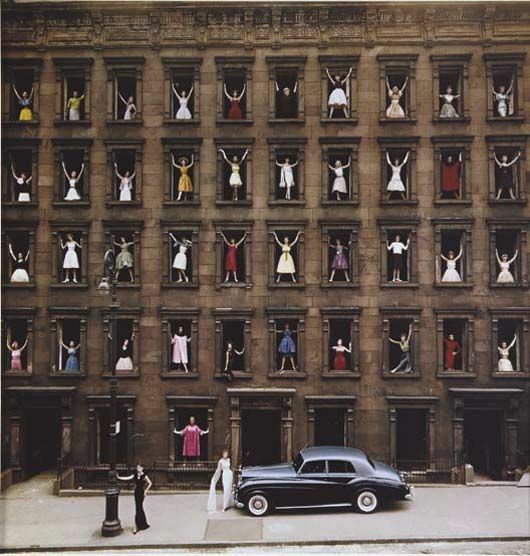 The day before the buildings were razed, the 43 women appeared in their finest attire, went into the buildings, climbed the old stairs, and took their places in the windows. I was set up on my fire escape across the street, directing the scene, with bullhorn in hand. Of course I was concerned for the models’ safety, as some were daring enough to pose out on the crumbling sills. The photography came off as planned. What had seemed to some as too dangerous or difficult to accomplish, became my fantasy fulfilled, and my most memorable self-assigned photograph.